On July 12, 2009, a bus carrying a youth group from Shreveport, Louisiana, to a youth camp in Georgia overturned when two tires failed near Meridian, Mississippi. Most of the twenty-three passengers were injured. Maggie Lee Henson, age twelve, died three weeks later from traumatic brain injuries sustained in the accident. This story, Maggie Lee for Good, is one part worst-case scenario and three parts God’s creative redemption. In it, her parents describe the overwhelming grief of losing a child, their struggle with faith, and the unexpected acts of love and generosity that result from their loss. John and Jinny Henson’s story captures the essence of Maggie Lee’s boundless faith and will inspire readers who are facing loss, searching for evidence of God’s sustaining grace, or looking for ways to make a meaningful difference in the lives of others. It is a powerful reminder that there is no tragedy so profound that God cannot bring good from it. The life and death of Maggie Lee Henson began a movement of kindness that is still reverberating. More than just a feel-good story, her story is proof that the human spirit will triumph even when the body fails, that people do want good to win, and that God is very much at work redeeming the world and even our worst-case scenarios. The best way to join Maggie Lee for Good is to click the “Like” button at this Facebook page: facebook.com/MaggieLeeforGood. 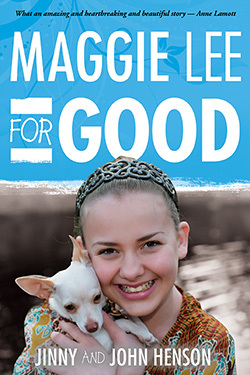 If you would like to present “Maggie Lee for Good” to your school or service organization, visit www.maggieleeforgood.org to access free tools, graphics and printables. Jinny Henson is a graduate of Baylor University and Southwestern Baptist Theological Seminary. She and her husband, John, launched the Maggie Lee for Good movement. She has traveled the country performing stand-up comedy and attributes God’s gift of laughter as one of the secrets to her family’s survival of tragic loss. Jinny’s blog is jinnyhenson.wordpress.com. John Henson is a graduate of Stephen F. Austin State University and Southwestern Baptist Theological Seminary. He is founding pastor of Church for the Highlands in Shreveport, Louisiana. John also serves as Chaplain for Volunteers of America, North Louisiana and maintains a blog at www.revjohnhenson.com.